I love tools! When I see a tool that I don’t have, my mind tries to create some need for it. And I already have a ton of tools. There is no way around it in this business. But from experience, I have learned when to splurge and when to go bargain shopping for a massive discount. For example, do you know where you can get free hand tools? (I’ll tell you more about this in a bit). Sometimes you need to plunk down hundreds or even thousands of dollars for a specific tool, but often there is a used or bargain version that will do the job almost exactly the same, but cost 70%-90% less. 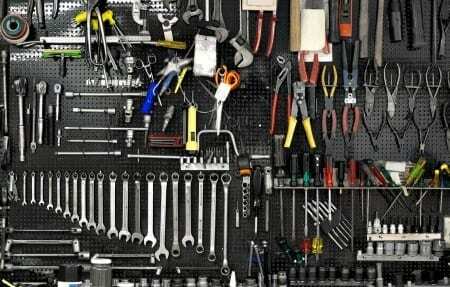 In this post, I’ll show you where to go and what to buy to get the maximum tools at minimum cost! It’s local, there are no shipping costs and no sales tax. Plus everything is negotiable. If you’re a good negotiator Craigslist should be your go to place for huge discounts on tools (especially power tools). Like-New Tools – Look for tools that have barely been used. Tools where the owner bought it for a particular project and then didn’t need it anymore. You can usually get a 20%-30% discount on these like-new tools. Industrial Tools – Industrial power tools are crazy expensive. A lot of small businesses that are closing up shop will sell off their machinery at a HUGE discount. I’m talking 70% or more off! If you can be patient and wait for the right sale you can usually outfit an entire workshop in one stop. If you haven’t heard of Harbor Freight Tools it’s time you did. Their slogan is “Quality tools at ridiculously low prices.” The quality tool part is a bit questionable in my mind, but the ridiculously low prices statement is spot on. You won’t find heirloom quality tools. I affectionately refer to these as my “disposable” tools. I’ve bought some lemons here, but some have been absolutely amazing and they are all hugely discounted. For example, I have owned two Multi-Tools. The first is a Makita which cost $159 and the other is a Chicago Electric (Harbor Freight’s brand) which cost $9.99. The Makita is a little quieter and transfers less vibration through the handle, but they are both just as effective. The Chicago Electric died after about 3 years and the Makita is still going strong, but at 16 times the cost of the bargain brand it will have to work for 51 years to make up the cost! Not exactly worth it. Buy these tools for one-off jobs that you won’t need on a daily basis. I’ll also buy some of these cheap tools to test out how a particular tool works for a job before sinking money into the fancy brands. A lot of times the selection on Craigslist is limited because it’s only local folks, but Ebay has items all over the world for sale. Sure you will have to pay some shipping and the auction setup causes prices to get out of control sometimes, but you can still find many a deal on tools here. I use Ebay for hard to find and vintage heirloom quality tools. I’ve bought several glazing point drivers on Ebay for $15 when the new ones run about $170. The hard to find stuff is here. You just have to look around and be patient for the right tool at the right price. Who doesn’t love free stuff? Well, Harbor Freight also has an ad flyer that has a free tool available every month. You can use as many of the coupons as you want too. Join the Inside Track Club and you get even bigger discounts and more free tools. Tape measures, screwdrivers, hammers, etc. Basic hand tools are usually the free stuff, but a free tool is a free tool and if you are just getting started this is a great place to stock up or find Christmas gifts. I’ve gotten a least a dozen tape measures and screw drivers to outfit my shop this way! I don’t get any commissions from Harbor Freight, in case you were wondering. I just use them and love saving the cash. In certain situations you don’t want to buy used tools because they can be more trouble than they’re worth. Here are a few times when buying a used or discount tool is a bad idea. Batteries – Batteries and battery powered tools are rarely a good idea to buy used. Batteries have a limited life and they generally become less reliable as the years progress. Lightly used ones might work well, but anything over 6-months old is generally a bad idea. Repaired or Rewired – Think like buying a used car. If there has been a major wreck or it’s a salvage title, you probably want to keep looking. The same is true of power tools. If they have been extensively repaired or rewired you can’t always trust that the work was done properly. Stay away. Levels and Squares – If I’m buying something that has to be dead on square or perfectly level I never trust used or discount tools. I want something that is guaranteed to be perfectly square and true and level. Your eye won’t be able to tell if something is off, but when your projects come out misaligned you’ll sure notice then. If you’re looking for a specific tool for working on an old home, you can also check out my Old House Store. Just about everything we use in my restoration company is available there. It is an affiliate store so I do get a small commission (at no extra cost to you) if you do decide to buy something. Also, if you know of a great place to find a steal on tools post it in the comments below! I need help on how to tighten the Disc Guard on my Craftsman Sander/Grinder model 351.225950. Old machine but works great. The Disc Guard is loose and I can.t seem to get to the screws to adjust. It looks like one needs to remove the aluminum Disc to get to the screws that tighten the guard. Can,t figure out how to remove the aluminum disc. ” Totally a JOKE”Find a Crack head they steal all sorts of tools and put them on Craigslist at cheap prices, Hey that looks just like my router and its 15 bucks! I’ll get it so I have a spare! you get home and find out someone took it and 90% of the rest of your stuff! Turns out the only deal you got was your router back and it only cost you 15 bucks. It’s your Lucky day! Sorta! Now the upside is if some steals all your tools look at pawn shops, and online Craigslist. But you can take steps to end theft by putting a driver’s license number on the tool don’t use your Social security number. It would be pretty hard for a cop to get the thief to explain how your driver’s lic number was on that tool with your initials. Estate sales are pretty great, alot of times someone old has died and that means they have quality hand tools that you can get for a bargain. Craigslist is pretty great as well you just need to know what to look for. I bought my used Powermatic tablesaw this way. I brought my dial indicator and gauge feelers to test various tolerances and I was able to get $300 off negotiating. Lots of good information here, great post! I know it’s late in the season now, but I’ve had terrific luck finding tools at garage sales. The ones where it’s a dear old gentleman selling can be particularly rewarding…I get to pick his brain, And I get a discounted tool or two. At my last one, he threw in a board of oak and a big old board of poplar for nothing!